Last month scientists at Tufts University announced that they had created a sensor that can be mounted on a tooth to track diet quality and make tailored nutritional recommendations. Around the same time, Microsoft announced that it had developed software that could translate Chinese to English as fast and as accurately as a human. To top it off, just last week the world learned that there is now a robot that can autonomously assemble furniture. Such stories make it clear: to read the science and technology news today is to see a world of rapid progress and infinite potential. And from one perspective it is. But we believe that now is a good time to remind everyone of a fundamental limitation of the ability of technology to make the world a better place. All of these advances in one way or another rely on the internet - a tool which remains foreign to over half of the world’s population. The Broadband Commission for Sustainable Development says that the world will not even achieve 50% internet use until the end of this year. If the world maintains current internet user growth rates – a big if – we won’t approach 100% global internet adoption for well over two decades. In that time experts predict that the Fourth Industrial Revolution will be in full swing. We will be connected to a vast Internet of Things network that will feed unimaginable amounts of data into ever more advanced artificial intelligence tools, enabling us to create new and highly disruptive products and services that generate huge amounts of wealth. Or, at least those of us with an internet connection will be. If this situation is not resolved soon the benefits of the Fourth Industrial Revolution will accrue principally to the global haves, leaving the have-nots even further behind. This is not to argue that the only thing stopping one of today’s Least Developed Countries from becoming a global leader in artificial intelligence is getting their full population online. Rather, doing so would create a national digital ecosystem that increases a country’s chances of being a player. In particular we should not discount the prospect of emerging economies launching homegrown industries that offer tailored products to national or regional populations, driving economic growth and helping to fight global inequality. Do not forget the example of M-Pesa, a leading global mobile payments provider that is 50% African owned and has its largest user base in Kenya. This perspective, that countries with minimal internet penetration are likely to miss the Fourth Industrial Revolution, is why the digital divide matters so much now. It should play a much more central role in discussions about internet development at the global level. One of us saw first-hand how a poor Indonesian entrepreneur grew his income seven-fold in nine months when he received an internet connection in his home. He used Facebook to find distributors for the food product he made, convinced several to make a visit, and signed contracts with every one. The other witnessed how an eight-year-old boy was able to use the internet to save the local economy of a village in northern Brazil. The village survived on selling chickens, and a very large number of local hens had recently begun eating their own eggs. This was traditionally seen as a sign that the bird was possessed by spirits and needed to be put to death. But the boy was able to find a YouTube video that explained it simply indicated a calcium deficiency in the chicken’s diets, well within the villagers capacity to solve. Yet as compelling as these arguments are, they have not adequately swayed the global debate. Despite the fact that the rate of internet growth is too slow, despite the fact that the Global Infrastructure Hub has identified a $1 trillion global financing gap for Information and Communications Technology (ICT) infrastructure between now and 2040, over the last six years multilateral development banks have devoted just 1% of their resources to this issue. Why? 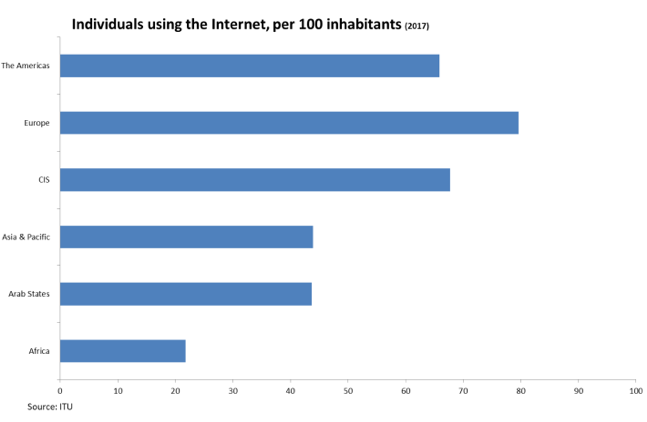 A recent survey supported by the World Wide Web Foundation showed that investment in ICT connectivity is seen overwhelmingly as the domain of the private sector, and specifically of mobile operators. This needs to change, and a good first step is to flip the argument. If governments, whose requests to development banks drive the MDB loan portfolio, cannot justify ICT investments on sustainable development grounds, perhaps they can do so by showing how connectivity is now imperative to taking part in the Fourth Industrial Revolution. This might also help generate the political will to clarify regulatory regimes and make the sector more transparent and attractive to non-traditional private investors. At the World Economic Forum we are working with governments and regional bodies on ways of broadening the pool of connectivity investors through our Internet for All project. New research that we have just launched shows that in areas of low internet use mobile operators face a difficult investment environment. Though in some cases the returns to connectivity investments can exceed the costs in less than two years, these returns are accrued to the economy as a whole rather than to a private investor. Network operators often need co-financing to make an investment profitable. If we bring more players into the ICT investment space, we can start to socialize the costs of investments to better reflect the disbursement of returns. This should significantly increase ICT infrastructure development. But it starts with thinking about the internet differently. Connecting a population is not just about economic growth or social inclusion. It’s about keeping your country from missing the Fourth Industrial Revolution, furniture-building robots and all. Our report, Financing a Forward-Looking Internet for All, is available here. 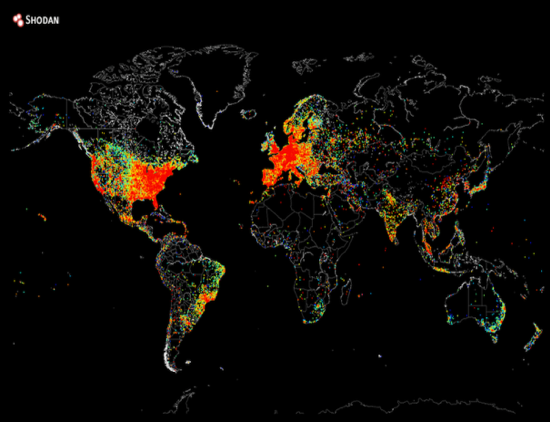 How far are we from internet access for all?